The square of paper had two rough edges and two smooth edges and that told me where it had originated. It was on one of those squares of paper that we used to find all over Benito and Mariana’s house in neat pads held by a tiny binder clip. They both would check the back of any 8½ x 11 piece of paper they were getting ready to throw out and if was blank, they would neatly rip it into fourths and add the four squares to the nearest binder clip of paper. They were thrifty that way. Those bound scraps were perfect note pads always within easy reach, found next to each telephone, on nightstands and coffee tables, on the kitchen counter, and on Benito’s desk. 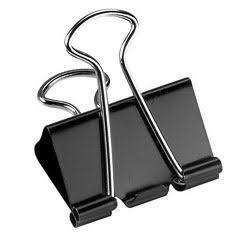 Perfect for grocery lists, telephone messages, math calculations, bookmarks, scribbles. I promptly found my tablet and googled the first line. It was the lyrics to the 1946 song “Another Night Like This” written by Ernesto Lecuona, the Cuban pianist and composer, for the forgettable 1947 MGM film Carnival in Costa Rica starring Vera-Ellen, Rick Haymes and Cesar Romero. 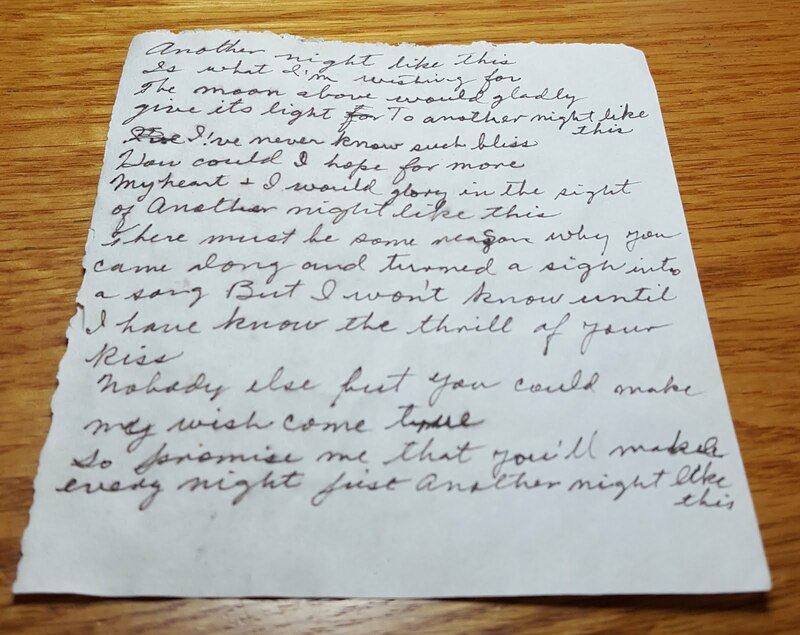 Lecuona had written the music and Spanish lyrics for it, and the prolific American songwriter Harry Ruby wrote the English lyrics Mariana had written down on the scrap I found. I wondered why she wrote them down? It must have been a spur-of-the-moment thing. Could she have been watching Carnival in Costa Rica on TV? She and Benito both watched old movies on American Movie Classics, the cable channel that played old movies back then. 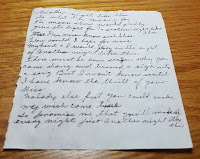 But she wrote the entire song on that scrap, so I have to think that she must have known it was going to be sung on the movie and was ready, pen and paper in hand, for when it came on. My guess is that she first saw the movie when it came out in 1947. It surely played in one of Camaguey’s movie theatres, in Spanish, of course. I don’t know if you know this, but typically only the speaking parts of movie musicals are dubbed into a foreign language, the songs stay in English. Or maybe she saw the English version of the movie while at school in Canada. The song was written a year before the movie came out. 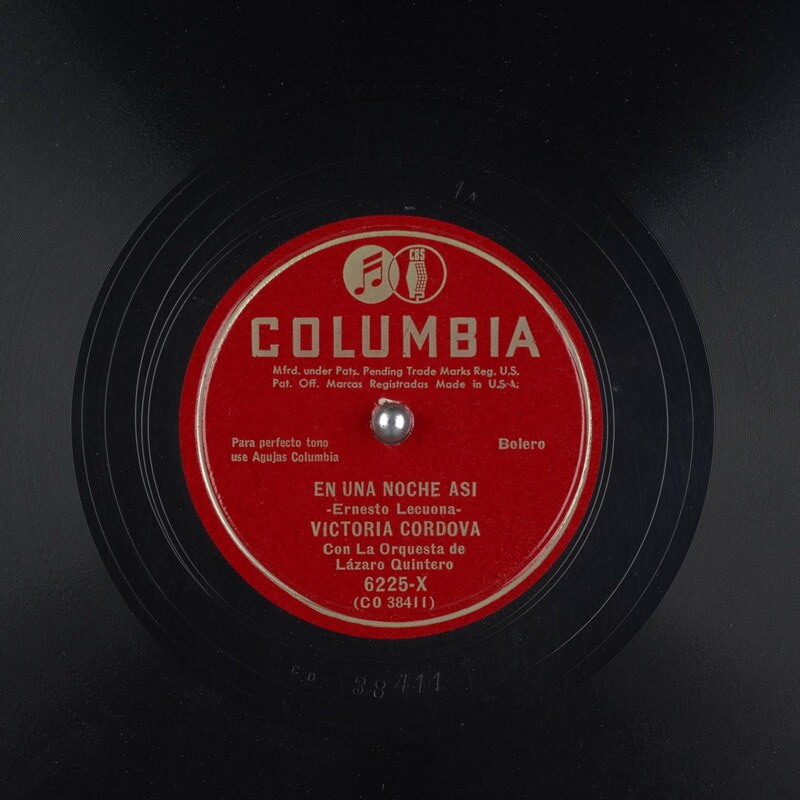 Its original Spanish version, En Una Noche Así, must have played on Camaguey radio stations that previous summer. Native son Ernesto Lecuona was at his height of popularity so there is no doubt there was a lot of air play. I’m sure both she and Benito knew the song: they loved Lecuona’s music. The novelty of hearing it in English on the movie must have stayed with her for her to know it was going to be sung on the movie she was watching all those years later in the 1990s. Still, it is hard to write that fast and get it all right the first time and there is only three crossouts on the paper. She could have done it, but she could have also written it in shorthand first on one scrap of paper, and then immediately copied it out in longhand on the scrap I found. Why though? Why take the time to write down the lyrics to this particular song. It’s not like she did this often. We never found a song lyrics stash. Maybe it was to read it out loud to Benito. Or to one of her friends on the telephone: “Do you remember the song …?” Or maybe she was saving it to ask Benito to play it on the piano while she sang along. He had a good memory for music. And then she kept it, and later she tucked it into a photo album. Or maybe it was tucked in later by one of her children when they were packing up Mayfair Manor for the move to the nursing home. It’s amazing what you think of, guess and invent when you come across a scrap of paper in your mother’s handwriting. First time here? Start with these entries. Who are the Maryland Prats? Got some photos or stories to add? Email them to me, jjp@tacdig.com.